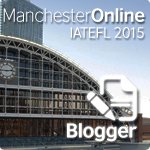 In this post, I'll share one of the speaking lessons that I've conducted with my Year 4. 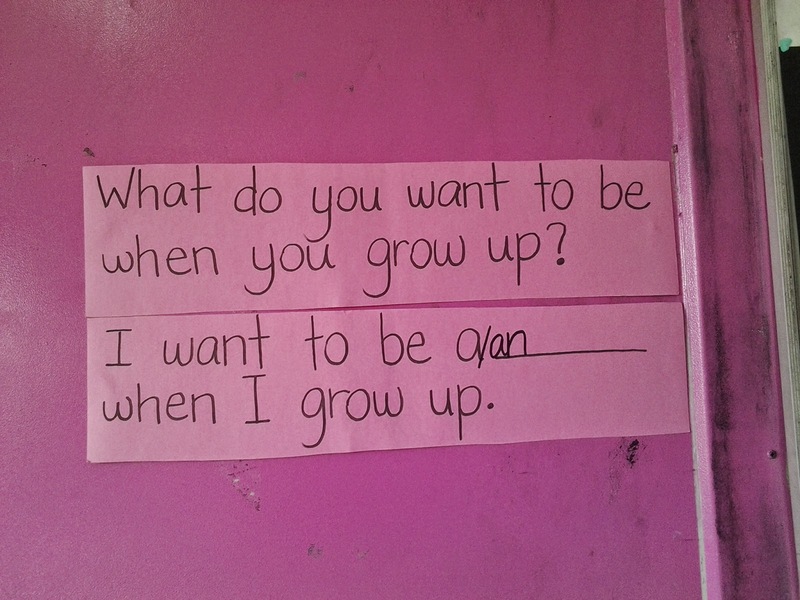 "What do you want to be when you grow up?" 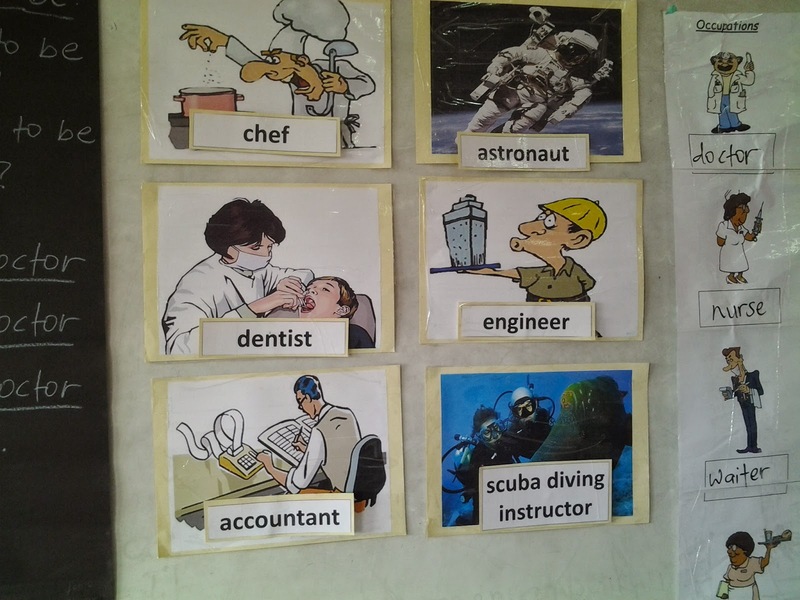 "I want to be a / an ..."
To revise the vocabulary for occupations, I started the lesson by asking the students about their ambitions. I distributed post-its and asked the students to write their ambitions on them. Then, I drew a large circle map on the board. The students put the post-its on the circle map. I used the circle map to introduce the target language. **No, that wasn't my voice in the recording. I played the guitar while my sister, Sandy lent me her voice. Thank you, sis! I drew a table like the one in the picture below on the whiteboard. 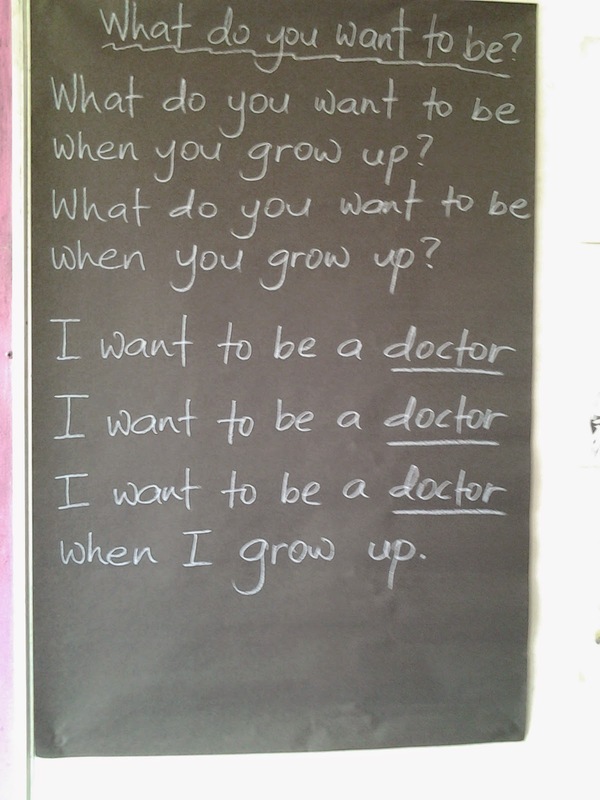 I asked several students about their ambitions. 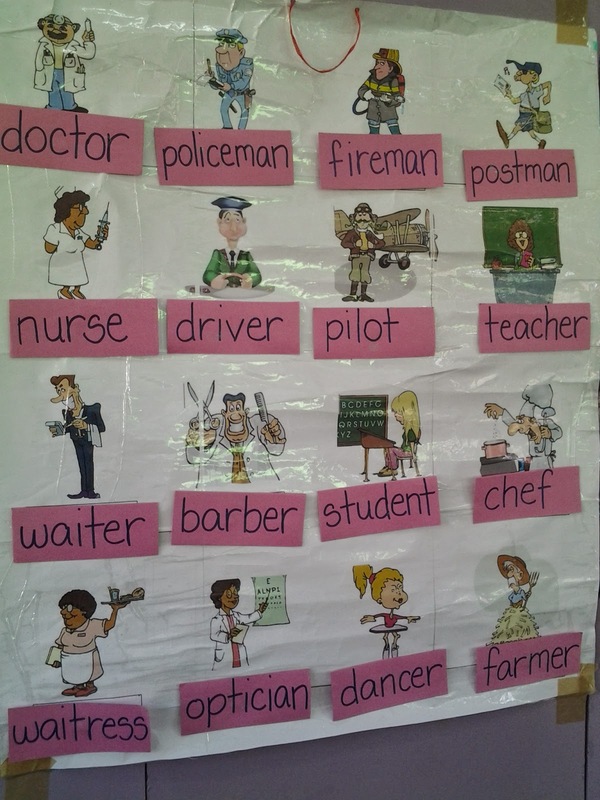 I demonstrated how to use the target language to get the information needed to complete the table. I handed out worksheets with a similar table for the students to complete. We did the 'mingling' activity. 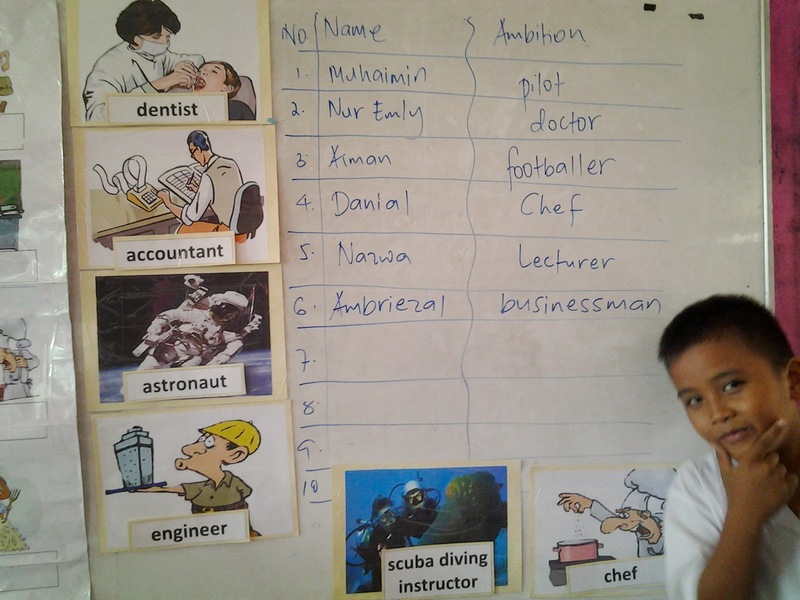 I asked the students to go around the classroom and ask their friends about their ambitions. 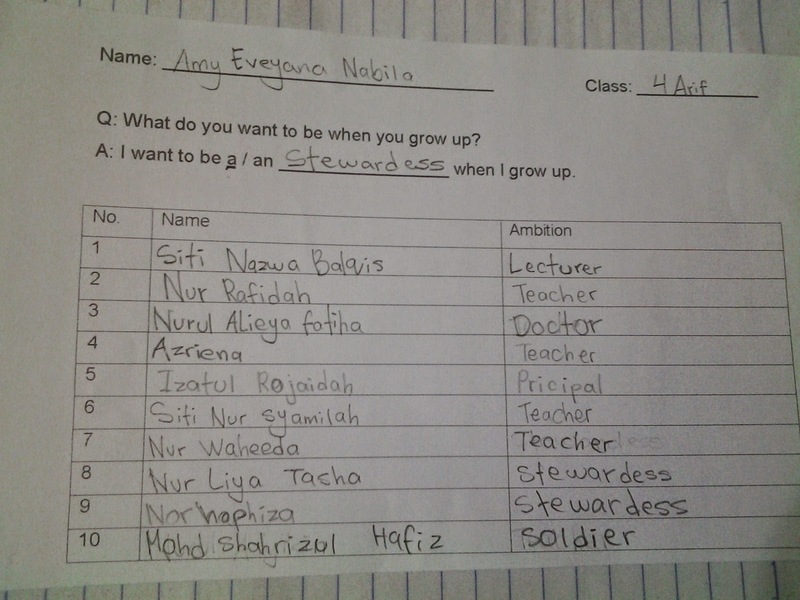 They must use the target language to ask at least ten of their classmates what they want to be when they grow up. Yeah, it was a bit noisy. There were 40 students in the class and they were really excited about the activity. I think the students were awesome, though. 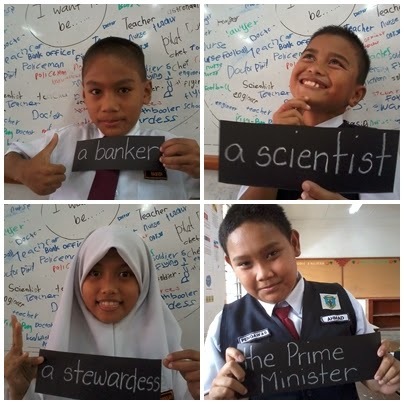 I asked several volunteers to share what they found out about their classmates' ambitions. 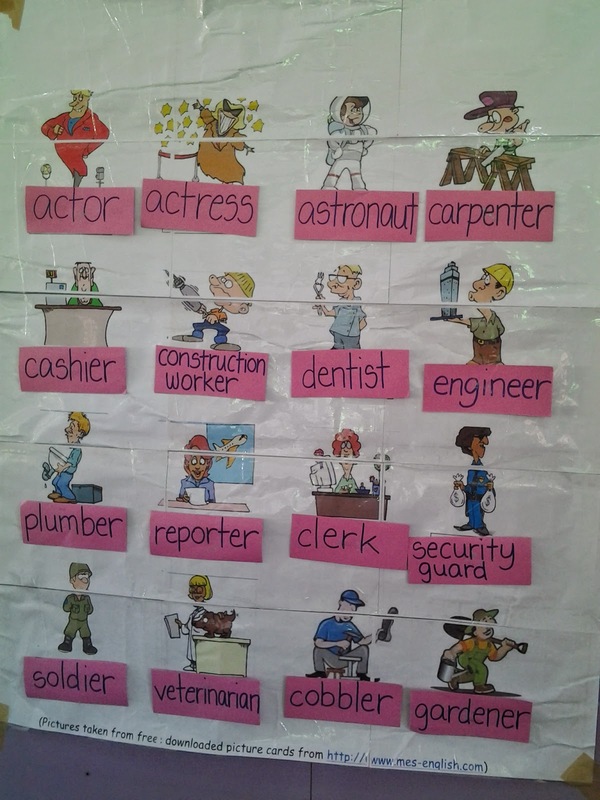 I guided them to say sentences like "Ambriezal wants to be a businessman" and "Amy wants to be a teacher." 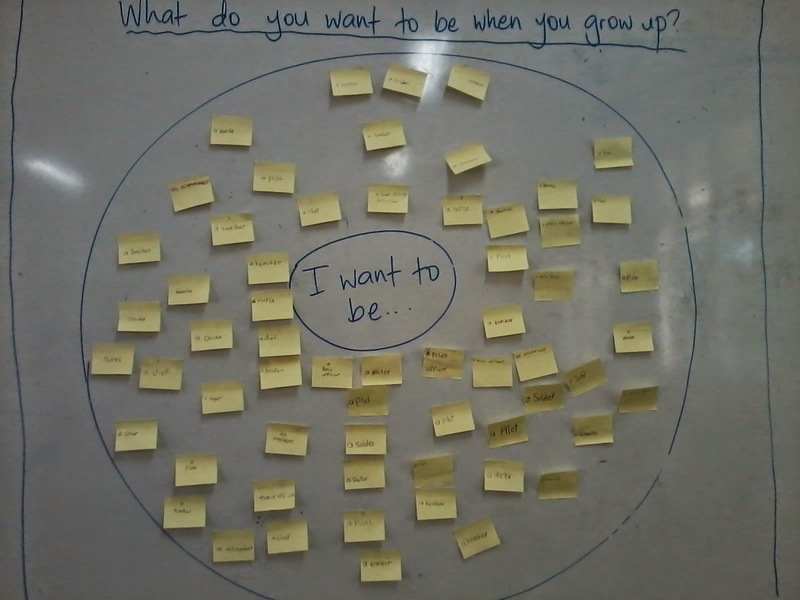 Before we ended the lesson, we sang the 'What do you want to be?' song again. 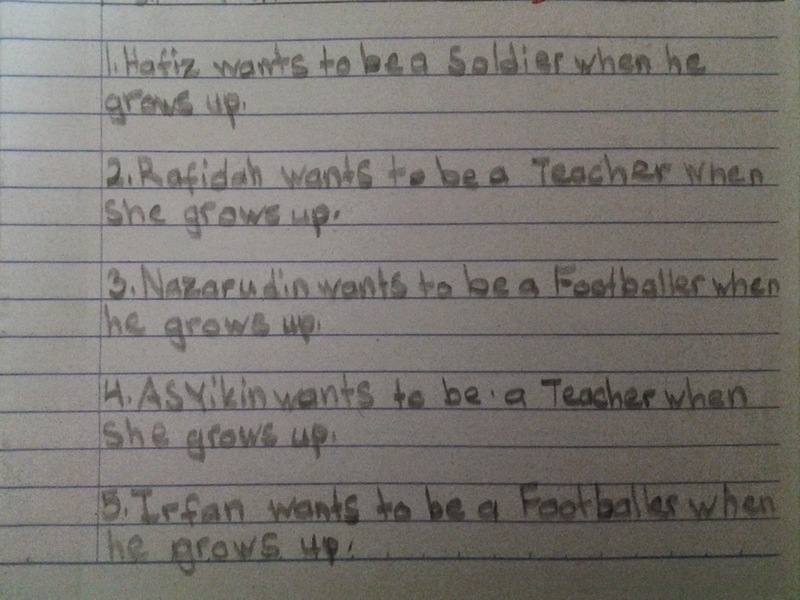 "Asyraff wants to be a soldier when he grows up." 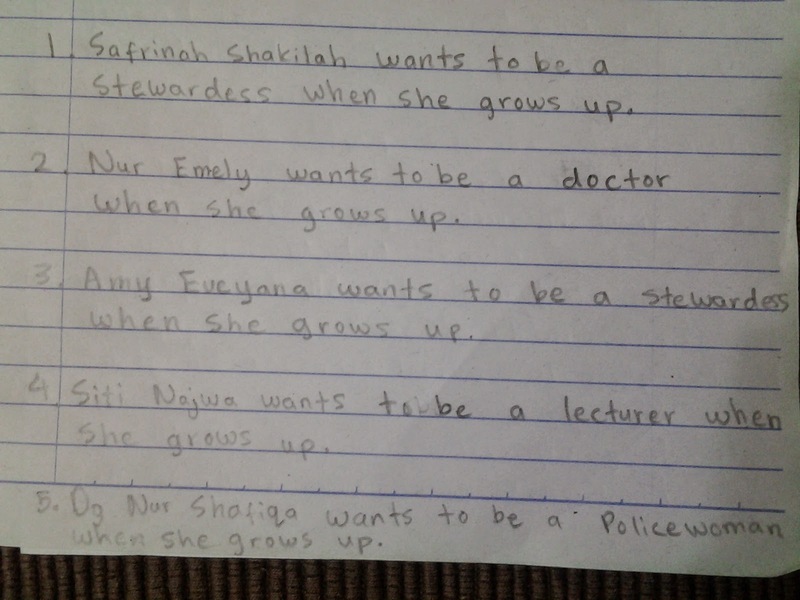 "Nazwa wants to be a lecturer when she grows up." 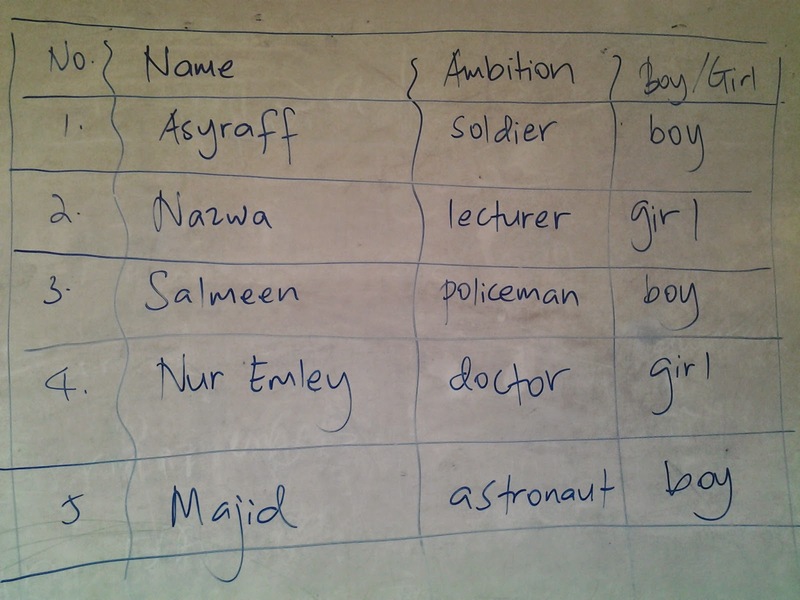 To help the students practise, we did the shared writing activity. 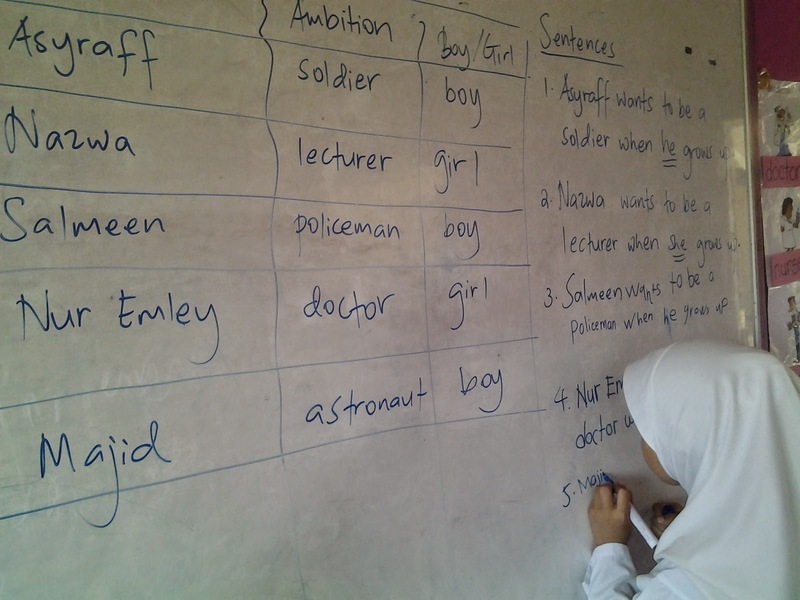 Several volunteers wrote sentences on the whiteboard based on the information in the table. I've uploaded the materials that I used in the lessons on Slideshare. Feel free to download and use them in your class if you like. **You can print these in poster size and turn them into classroom charts just like the ones in the pictures above. Leave me a message in the comment if you need help with that. If you have any ideas or suggestions on how to make the lessons better or more interesting, please share with me! You can leave a comment below this post, or just drop me a line on my Facebook page. 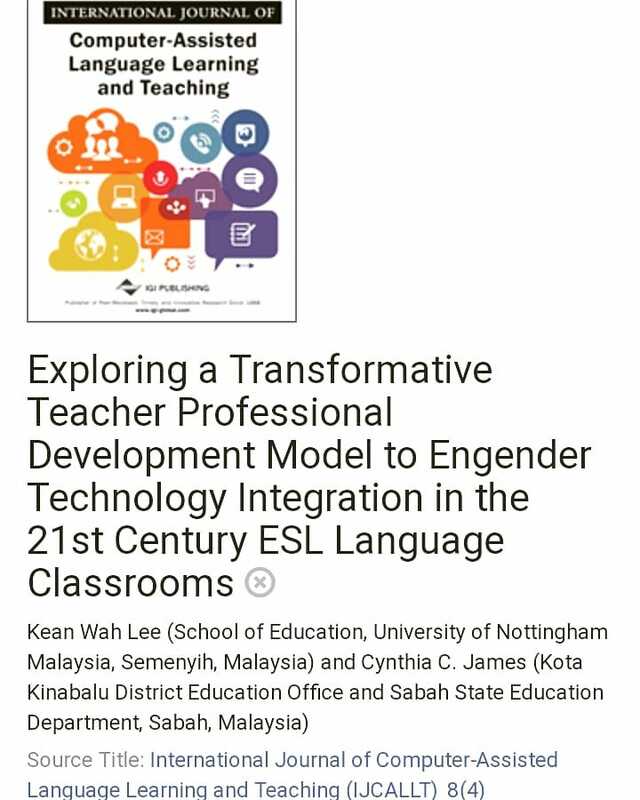 Tq for sharing the activities ! Thank you very much for sharing the activity. love it...tq for sharing cyn..
Wow.. Well done!! 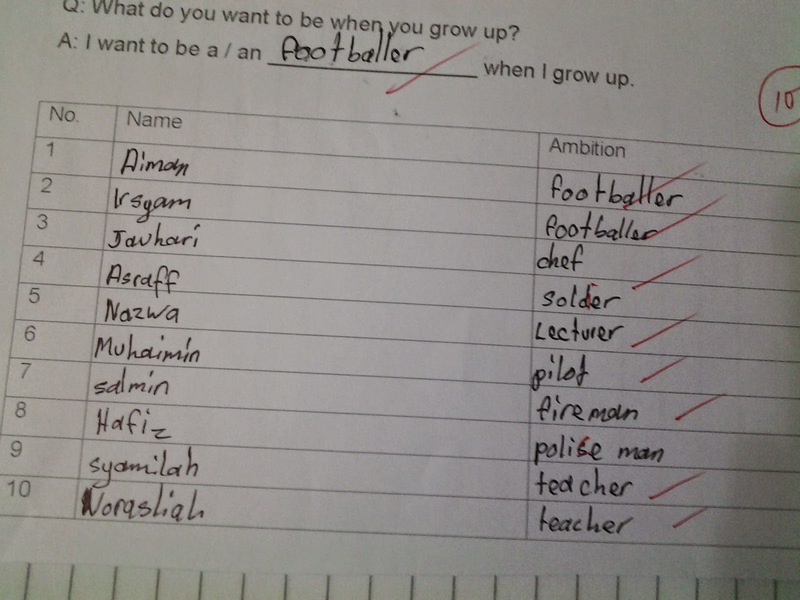 Good job..
Wow... what a meaningful lesson. Thank you for sharing. Madam, can you share how you manage your materials after your lesson for future use? A great deal of informative and advantageous guidance imparted by you. I truly admire you for this tremendous work. Continue writing and keep us updated with your knowledge. Thank you so much for sharing the activities.it really helped me. Please keep up the good work.